In my mind, courtesy of all those Miss Marple and Poirot TV series, I think of Agatha Christie as writing contemporaneously about England between the wars, still hanging on to its empire and with upper-class privilege unchallenged. In reality, Agatha Christie continued to publish crime novels into the mid-1970s. I was shocked to realise that, when this book was published in 1969, I would have been of an age to attend the children's Halloween party that the book starts with. Yet Poirot is still there. An older dies-his-hair-to-keep-it-black Poirot, now on his thirty-ninth fictional outing. He is brought into this case by Adriadne Walker, a crime writer who is a sort of fictional twin for Agatha Christie herself. Both of them are clearly creatures from an earlier age, (a phenomenon I am becoming personally acquainted with as I plod on into my sixties). They, and the older characters around them, spend a great deal of time discussing how times have changed for the worse. There are recurring laments about the mentally ill being let loose to threaten the populace because the asylums are too full; about the sad loss of the death penalty as a deterrent to "wronguns"; about young women who, no longer protected by their families, place themselves at risk by venturing out alone and being attracted to the wrong kind of man; by the rise to normalcy of sexual assaults on children and the inappropriateness of empathy in magistrates which results in mercy taking precedence over justice. At times, I felt as if I had wandered into an editorial from the Daily Mail. "The Halloween Party" has what these days I'd think of as a post-episode-100 feel, when a TV series is stocked with characters we know so well that there is nothing new that they can do but we enjoy watching them do it anyway. The pace is leisurely. 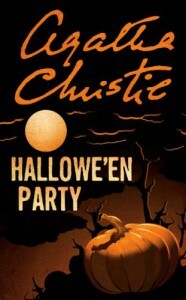 We gently trotted through the evidence gathering as Poirot interviewed the people who were at the Halloween Party in which a child was drowned in an apple-bobbing bucket. I was surprised at the way this death was treated - as if it were not so much a tragedy as a slightly embarrassing inconvenience. This turned out to be a plot device of sorts but it fitted into the emotional climate of the community so well that I didn't realise that until later. As we reach the denouement we do have to canter a bit and there is some physical action, although it does not, of course, involve the elderly Belgian gentleman with the big moustaches and the too-tightly-fitting patent leather shoes. Beneath the culture-shocked social commentary and the only slightly muted patronising of those who live in "the kind of new houses that ordinary people can afford" there is a quite respectable plot, involving forgery, deception, murder and a lethal form of narcissism that was quite chilling. What stood out for me was how well some of the children were drawn although they seemed rather old-fashioned children for the times. It also seemed to me that all the energy of this book came from the women. The men were little more than plot devices but I was left seeing the women as powerhouses of energy looking for an outlet. I rather liked Adriadne and I found Poirot's small vanities combined with his controlled compassion rather endearing. Hugh Fraser narrated the novel, with his, to my ear, perfect mimicry of David Suchet's Poirot and gaveAdriadne a voice that invoked the ghost of a slightly higher pitched Margaret Rutherford. This is a comfortable mystery, despite its grim content. I enjoyed it as much for its timely reminder of unrepentantly Tory views on English life and morals were (are?) like and for its insights into how the old can fail truly to see the world the young live in as for the mystery itself. I read this book for the Genre Suspense square on Halloween Bingo.